St John�s population grew from the low hundreds in 1800 to about 10,000 in 1900. The most useful guide to social standing is occupations, as given in census returns. These show the poorest in the oldest areas and the wealthiest in the newest ones. So, for all of the century, much of Brookmill Road and its courts (including the evocatively named Gutter Buildings) were populated by labourers, beggars and tramps (i.e. itinerant labourers) throughout the period. The streets immediately to the south such as Ship Street and Nelson Street, however, had more skilled workers in the 1840s, but lost them to newer streets in the periphery of the development as the century went on. Clerks, the archetypal occupation of the aspiring lower middle class, were to be found in Ashmead Road by 1881, and it was only Cliff Terrace and the houses on Lewisham Way that housed those working in the professions. St John�s population on average lived in less crowded circumstances than Londoners as a whole or other Deptford residents. 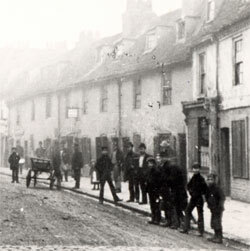 But the average number of persons per property increased as the 19th century progressed and the most crowded areas, in Mill Lane, were of an above average density. In contrast the most upmarket houses had fewer occupants in larger properties. Like the rest of London the population growth of New Town was sustained by immigration. The area shows a higher proportion of immigrants in its wealthiest and poorest residents. A high proportion of the poor in Mill Lane were from Ireland, while the professionals came from a wider area of south east England. Those in manual and semi-skilled occupations came from Deptford and surrounding parishes, suggesting St John�s was somewhere to aspire to when one wanted to move up-market, but stay in the same general area.